California Genealogical Society and Library blog: This Blog is Ancestor Approved! This Blog is Ancestor Approved! 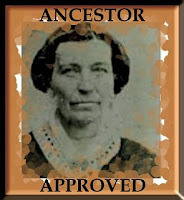 Russ Worthington of A Worthington Weblog has honored the CGSL blog with the Ancestor Approved award. Thanks, Russ! Leslie Ann of the Ancestors Live Here blog created the Ancestor Approved award to let her fellow genealogy bloggers know how much she appreciates and enjoys their blogs. I think it's a great idea. I would like to pass the award and honor several genealogical societies that launched blogs in the past year and have kept them going. Blogs are easy to start but it takes commitment to persevere! The FGS Voice blog was started by the Federation of Genealogical Societies in March 2010. Joan Miller created the Alberta Family Histories Society Blog in March 2010. The Johnson County, Kansas GenWeb site started the KS GenWeb: Johnson County blog in March 2010. The African American Genealogical Society of Northern California started the AAGSNC blog in May 2010. Mr. Geneablogger, Thomas MacEntee, started the Illinois State Genealogical Society blog in May 2010. The Ontario Genealogical Society launched its blog in June 2010. GSNOCC Musings was created by the Genealogical Society of North Orange County California in July 2010. Nevada Roots - Nevada State Genealogical Society blog came online in July 2010. The Contra Costa County Genealogical Society blog debuted in August 2010. The Utah Genealogical Association started a blog in September 2010. Blogs are a great way for organizations to communicate with their members and the outside world. I follow all genealogical society blogs so if I missed yours please let me know!